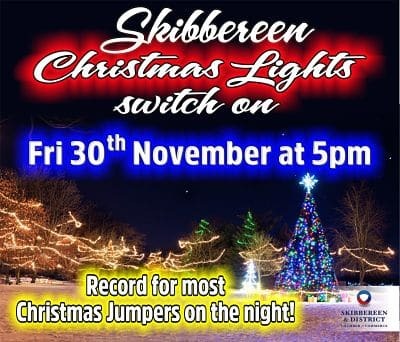 Festive fun launches in Skibbereen on Friday 30th November when the annual Christmas Parade welcomes Santa and Mrs. Claus into town where they will be joined by Skibbereen Fire Service, West Cork Civil Defence and a few other familiar faces who will be there to join in the fun too! 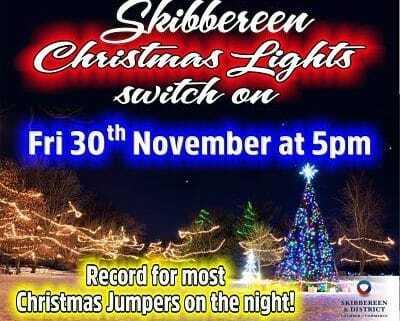 This year Santa will switch on Skibbereen’s Christmas lights along with 2 lucky winners from local national schools so make sure you complete your entry which can be downloaded from Kids Comp Entry 2018 and drop off to Apple Betty’s in the Square or O’Sullivan Toymaster at the Bridge before the 26th November to be in with a chance of winning. As well as the parade, street entertainment will be adding to the Christmas Carnival atmosphere in town on the evening along with festive stalls serving hot drinks and Christmas treats.